The first script helps set the IIS log format via Powershell by parsing the applicationHost.config file and making necessary changes. IT can be executed from a remote machine. This should aides initial configuration. 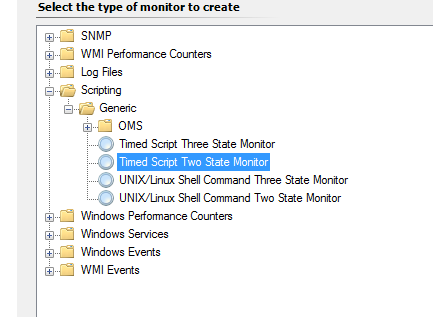 The second is a vbscript to be included in a SCOM Monitor to throw an alert if the log rollover configuration changes on any OMS-attached servers. It will display the site name and configuration in the alert description. Once the configuration has be resolved the monitored will reset back to healthy automatically. #Script to remotely change IIS log rollover frequency. $period = read-host "What frequency to set? 'Monthly', 'Weekly', 'Daily', 'Hourly' (Default='Hourly')"
write-host -ForegroundColor Yellow "Connecting to $computer and setting rollover frequency to $period"
Write-host -ForegroundColor Green "$_ is now set to $period (was $currentPeriod)"
Write-host -ForegroundColor Green "Site Defaults is now set to $period (was $currentPerioddefault)"
To create a SCOM alert on any IIS misconfiguration, create a two-state monitor. I created it as disabled, targeted to "IIS Server Role", and then used an override to apply it to a group containing my servers that are connected to OMS. 'strAlertDescription = "The following sites are not set to Hourly IIS log rollver:" & VbCrLf ' We will need this for alert generation. 'Specify the SiteDefault Node and read the logFile Period attribute.
' Now we the rest of the sites on the IIS box.
' Now loop through them checking the logFile period attribute, and append to the description if not set correctly. logfileNode = "/configuration/system.applicationHost/sites/site[@name='" & strSiteName & "']/logFile"
if sNode is nothing then ' Need this check here as if there is nothing configured, then it throws an exception. The end result you should get an alert similar to this. A useful way of seeing if configuration changes that might be useful to some environments.